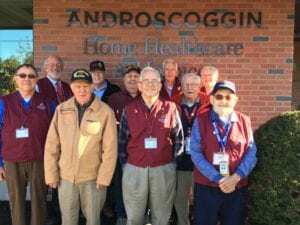 Androscoggin Home Healthcare and Hospice announced that their volunteer program received level 3 certification from We Honor Veterans. We Honor Veterans is a program of the National Hospice and Palliative Care Organization (NHPCO), in collaboration with the Department of Veteran Affairs (VA). The program is designed to help hospice organizations meet the unique needs of Veteran patients by promoting Veteran-centric educational activities, supporting the development of strategic partnerships, helping organizations to strengthen their capacity and competence to serve Veterans, and increasing access and improved quality of hospice services for Veteran patients. NHPCO’s We Honor Veterans program offers four-star levels of certification in Veteran care. Stars are awarded based on an increasing intensity in veteran-specific education for staff, volunteers and the community, initiating military history checklists into the patient onboarding process to identify Veteran hospice patients, and developing partnerships and collaboration opportunities with local VAs. 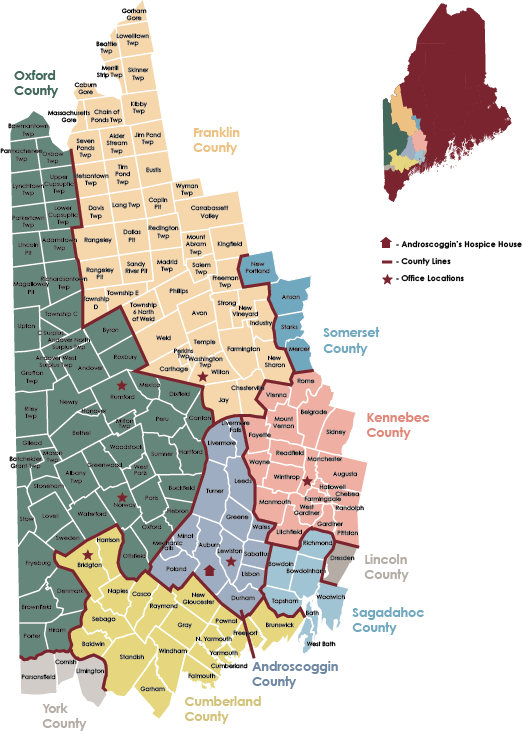 Androscoggin Home Healthcare and Hospice was awarded 3 Star certification, for their ongoing efforts to enhance the Veteran hospice experience. They have assembled a team of Veteran volunteers who visit with Veteran patients, in their homes, nursing homes or at the Hospice House. These volunteers also perform pinning ceremonies in which they pin a small American flag onto the lapel of hospice patients and thank them for their service, as witnessed by the patient’s family and friends. To date, the organization has performed 271 pinning ceremonies. 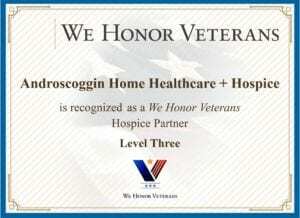 Androscoggin Home Healthcare and Hospice is already working towards their fourth and final level of certification through We Honor Veterans.